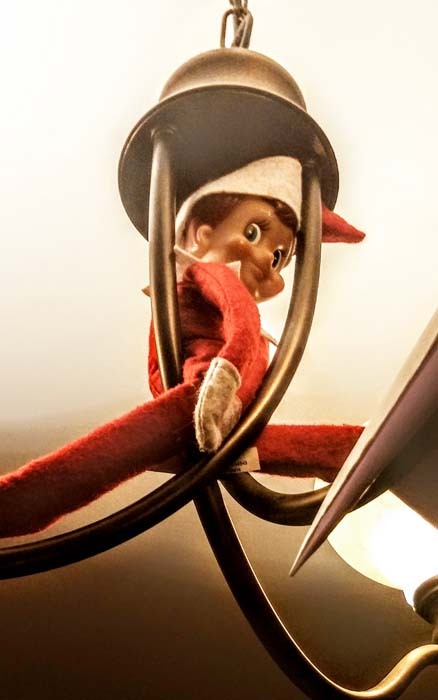 The next morning the magic returned: Dola (their elf) was hanging out in the kitchen, and his hat was right outside the exercise room door! Surely he’d been in there for days! Yes! Crisis averted! Christmas faith remains intact! And all it took was ascribing a few human attributes to some pretend characters (well, that and all the adults working together to pull it off). Then, an exciting thing happened: Jake lost a tooth! Because the Tooth Fairy was coming the boys decided to arrange a date for her with Dola! They made a lego truck for Dola to drive, they asked dad to turn off the security system, and they constructed a lego restaurant stocked with snacks. 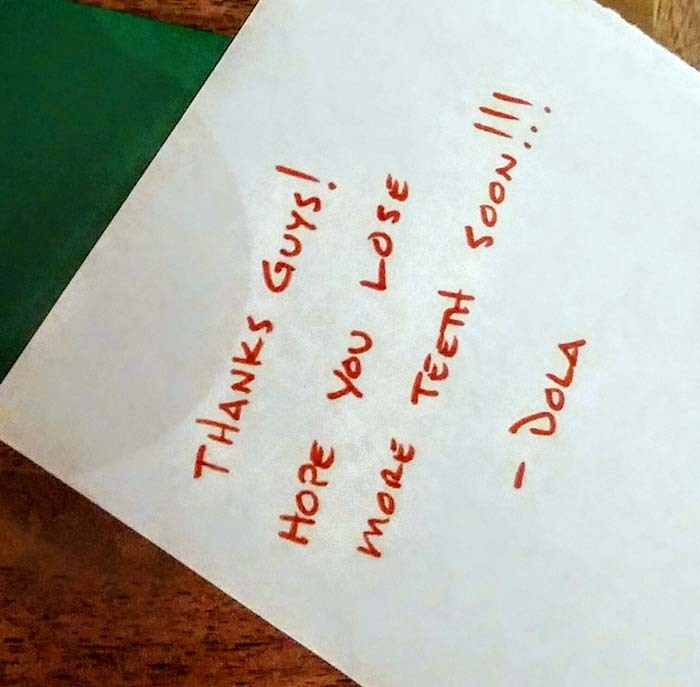 The next morning, they found a note from Dola! I know many of you don’t indulge these fantasies, but they are part of our family traditions. Nevertheless, as I was reflecting on the events of those days it dawned on me that the things that enable children to maintain their belief in Santa are terribly similar to the things that cause many to stop believing in God as they grow older. Ascribing human traits to Santa enhances the truth and keeps the vision alive. Ascribing human traits to God diminishes the truth and reality fades away. When we fail to ascribe to God all that he is: the Great I Am, the King of Heaven’s Armies, the Sovereign Lord, the Alpha and the Omega, the Ancient of Days, the Creator and Sustainer of all things (to name just a few), we short-sell him. Worse yet, we replace his divine, infinite, and supernatural attributes with finite, mortal, and limited ones! When we do that, our understanding of God is reduced to little more than Santa in the sky — an old man with a white beard who gives presents to good boys and girls? Doubts readily creep in with a God like that: Can God lie? Can God make mistakes? Can God forget me? Can he get his timing wrong. What if God doesn’t give me what I want? If God is not who he says he is in the Bible, are there rubber bands hidden just out of view? A God who is little more than a glorified or exalted man is a God who is hard to believe in because he is a God who can be arbitrary. Do I need to earn his favor? How can I make him like me? What if I fail? What if I make a bad first impression? Will there be a second date? A god like that will let us down often and it will be easy to dismiss him as a made-up tradition. But, that isn’t the real God, the real God is all-powerful, all-knowing, and always-eternally-present. The real God is found in the Bible. If we want to introduce our children to a God in whom they can believe, we must give them the God of the Bible because that is where truth is found. And truth is sufficient in and of itself..
God is not an imaginary character with human attributes ascribed to him. He is real and he alone is God. There has never been a time, nor will there ever be a time, when God did not exist as God. Do you often find yourself enhancing God with humanness (if that can be called enhancing) hoping that the people you know and love will believe in him? We must present God in all his glorious majesty. That is the God in whom we can place our eternal trust. Will you teach and lead with truth? Since you can only lead as far as you’ve gone, will you commit to go further in 2017 in your study of who God is, than you have ever gone before? Be sure to check out my new devotional.